So you’ve been playing your cheaper Makala Dolphin ukulele for a while now and you’re wondering what type of ukulele to buy next. The Kala KA-15s ukulele is a great next purchase. 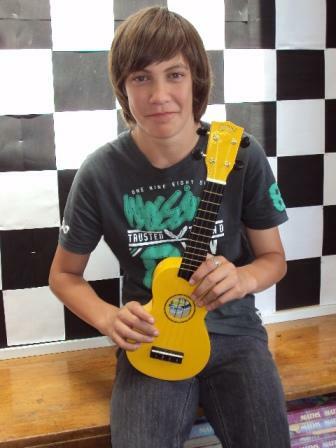 Kody made the step up to this ukulele and it cost him a reasonable $99 NZ. Which ukulele do you buy your kid when they want to to learn to play a ukulele? Well, there are a huge number you can buy, ranging from very cheap to very expensive. Start at the cheap end first, but not too cheap though! 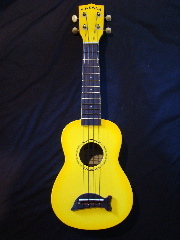 The Makala Dolphin ukulele, named so because of the dolphin bridge is an excellent ukulele to begin with for all ages. It comes in a range of colours that will appeal to kids and mums and dads too. The ukulele holds the notes well, but as with any new ukulele, it will go out of tune fairly quickly as the strings break themselves in. The more often you play and tune the ukulele the more quickly it will hold its tune, this is usually about two weeks. Where can you buy the Makala Dolphin ukulele? Just about all good music shops will be selling them. They usually sell for about $48 NZ. 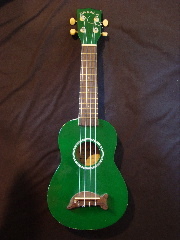 My first ukulele was a green Makala Dolphin and I’ve still got it. My young son ‘plays’ with it now, but I still strum on it just about everyday when I walk past it wherever he has left it. There are many cheap starter ukuleles that can be bought for kids if they are starting to learn to play. This review looks at the Mahalo U30G ukulele that comes in a range of colours. The colours certainly make them attractive to kids. If you want to buy one it is going to cost you about $40 NZ. Ukulele 4 Kids and Trey suggests buying a Makala Dolphin as your first ukulele might be the better ukulele to start with. Click here to read about the Makala Dolphin ukulele.